A common cross-zone detection technique involves the use of a two different methods of fire detection with each assigned to a separate zone. The advantage of this approach is an increased assurance that a fire is present before releasing the suppression agent. The table below lists several examples of cross-zone detection arrangements utilizing multiple detection methods. 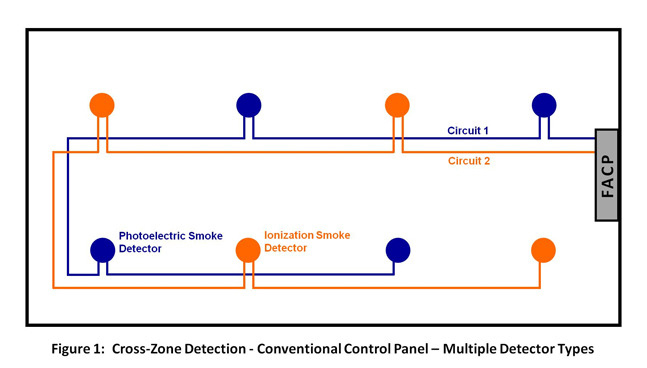 A typical approach involves the cross-zoning of spot smoke detection like ionization and photoelectric type smoke detectors. The characteristics of an ionization detector make it ideal for detecting fast flaming fires which produce smaller particles of combustion. Photoelectric detectors are most suited for slow smoldering fires that tend to produce larger smoke particulates. Depending on the type of fire, the response times will vary for these two types of detectors, but eventually both will detect the fire. 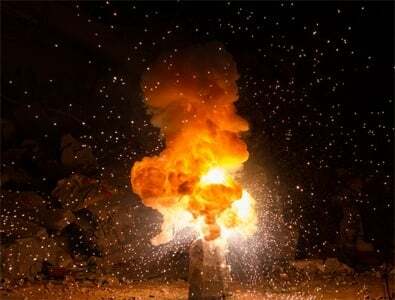 Cross-zone detection utilizing multiple detection methods minimizes the potential for a false alarm to result in a non-fire discharge of the suppression agent. 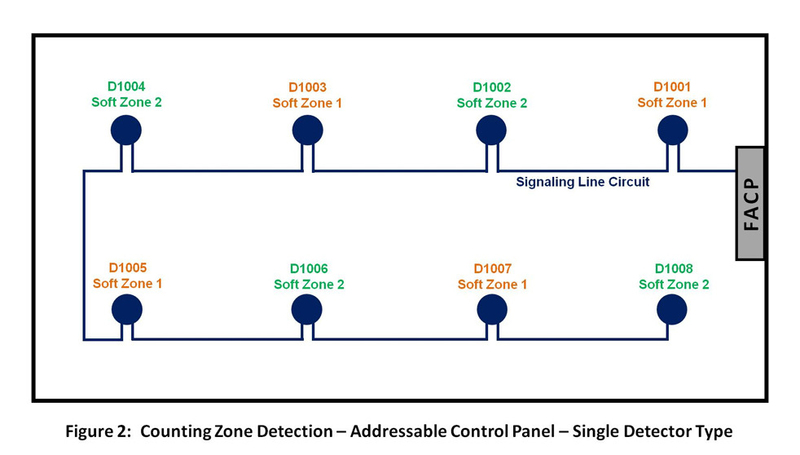 Alternatively, some cross-zone detection designs utilize only one type of detector. Many refer to this as a “counting-zone” since the control logic involves counting the number of detectors in alarm. This approach can only be accomplished with an intelligent fire alarm system using addressable panels having the unique ability to indentify individual detectors in alarm and the software intelligence to “count” them. When an alarm signal is received from the first detector, this constitutes a pre-alarm condition for the fire suppression system. Once a second detector initiates an alarm signal, the control panel will begin the release sequence. With a conventional fire alarm system, cross-zone detection always requires the installation of two physical detection circuits. Detectors are arranged such that adjacent detectors are separated into two individual circuits or zones (see Figure 1). In other words, half of the detectors are installed to Circuit 1 and the other half are installed to Circuit 2. The control panel is configured to activate a pre-alarm signal if one or more detectors alarm on a single zone. Once a detector initiates an alarm signal on the second zone, the control panel will begin the release sequence. On the other hand, cross-zone detection with an addressable control panel does not depend on the use of multiple individual circuits. Rather each detector is assigned a unique identifier (address) and transmits alarm signal data including this address to the control panel. Programming the control panel for cross-zone logic involves separating adjacent detectors by assigning them each to one of two software zones. In other words, half of the detectors are assigned to Software Zone 1 and the other half are assigned to Software Zone 2 (see Figure 2). Once the first detector alarms, the control panel recognizes the software zone it belongs to and activates a pre-alarm signal. As other detectors alarm concurrently, the control panel continues checking for their software zone assignment. Once an alarm signal is received from a detector assigned to the second (alternate) software zone, the control panel will begin the release sequence. When designing a fire suppression system for the protection of a data center or telecommunication facility, it is important to balance the need for the earliest warning possible with the need to prevent an unnecessary suppression release. For this reason, an increasing number of fire protection designers are now incorporating Air Sampling Smoke Detection (ASSD) into the cross-zone detection scheme. In many cases, ASSD is cross-zoned with spot-type photoelectric smoke detectors to trigger the suppression system. ASSD is capable of detecting very low concentrations of smoke and will offer the earliest possible warning of a fire in most mission-critical facilities. This cross-zone detection technique involves configuring the ASSD as Zone 1 and the spot-type smoke detectors as Zone 2. Typically, an alarm signal will be received from the ASSD first and will act as a pre-alarm condition for the fire suppression system. Often times, facility personnel will have several minutes or more to respond and possibly stop the fire in its incipient stage. If not, then the initiation of an alarm from a spot-type smoke detector will further verify the presence of a growing fire and trigger the release of the suppression system.